Shooting videos on the iPhone is fairly easy. But editing those clips into something compelling enough to share with the world can be a daunting task, especially for those of us who aren’t iMovie or Final Cut Pro pros. Global Delight’s Game Your Video wants to make the video-editing process as simple as possible, and it does an excellent job of it. Game Your Video is an iPhone app built to edit the videos you capture on your iPhone. The company says it wants to “gamify” the video-editing process, and does so by offering video-game like controls. While I’m not entirely sold on the whole gaming terminology, I was definitely impressed with all of the app’s editing features. It’s incredibly easy to add special effects, filters, music, and more to your videos—plus it’s fun. Once you launch the app, you’re taken to a home screen where you can choose Game Your Video—the video-editing mode—cut or join video clips, reverse a video, or enter I Did This—the app’s video-sharing network. You do most of the editing in the Game Your Video mode; you can choose to edit clips from your Camera Roll or from the app’s Library, which stores any saved videos that you’ve edited with the app. Make It Special: You can add numerous special effects to your video by tapping an editing feature when you want to apply it. When you’re editing, the video takes up most of the screen. Below it you’ll see a timeline and a scrolling menu of the editing tools. You can add more than a dozen special effects such as Slow (motion), Fast, Echo, Zoom, and Pixelate, among others. 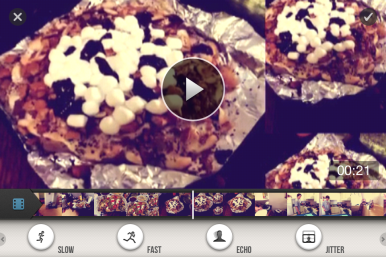 Just tap to play your video, then tap the special effect that you want to apply at specific points in your video. You can also add voice and audio effects—Laugh, Applause, Boo, and Giggle are just some offerings—and graphic elements like a cartoon smiley face or heart. Game Your Video is definitely not short on editing options. Perhaps the easiest way to give your video some extra flair is by applying one of the app’s many Flavors, which automatically give your video certain features. You can access the Flavors menu on the scrolling edit toolbar; from there you can choose between options like Chaplin, which will add a B&W filter, increase the speed, and add a Charlie Chaplin-like tune as the audio. Some other flavors include Psychedelic, Action, and Old Look. You can customize your video more to your liking by selecting a filter and then choosing a song from your iPhone’s music library or from the app’s eight music tracks. When you choose to add a song to your video, it will replace the original audio track. Currently there is no way to add music as a background element and still be able to hear the original video’s audio—for instance, people having a conversation. According to Global Delight, this feature is in the works for future updates. The app lets you make basic adjustments to your video, including Brightness, Contrast, and Saturation. And all of the editing features mentioned above can be accessed while shooting with the built-in Live mode. You can shoot a video and see any selected effect happening in real-time. While this will make subsequent editing harder—since you won’t have an original clip to work with—it is a neat feature for shooting quick, entertaining clips. They Did This: Check out other Game Your Video user videos in the app's video-sharing network. Once you’ve finished editing or shooting your video with the app, the finished product saves to your Game Your Video library. (If you shot the video with the Camera app or a different third-party app, the original remains untouched in your Camera Roll.) You can save your edited video to your Camera Roll or share it to YouTube, Facebook, or Game Your Video’s social network, I Did It. This was one of my favorite features, mainly because I could see videos that other Game Your Video users created. You can search videos by upload date, most viewed, or by Flavor. The videos do, however, have to be uploaded to YouTube in order to appear on the I Did It library. As someone who is not a seasoned video editor, I really liked Game Your Video’s simple editing capabilities. The app gives users extensive creative license without bogging them down in technicalities; there’s very little learning curve. It’s certainly not an advanced video-editing app like iMovie, but Game Your Video is aimed at a completely different audience. If you want create entertaining videos in the matter of minutes, Game Your Video is definitely a worthy option. For examples of videos edited with the app, check out Game Your Video's YouTube channel.